Chad/France, 2002, 81 minutes, Colour. Directed by Mahamat- Saleh Haroun. 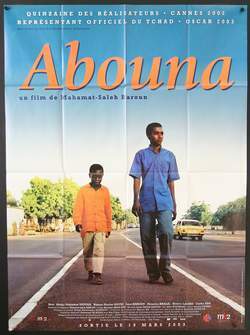 Abouna is a fine film from the north central African country of Chad. There are not many films which have emerged from this particular country, so Abouna is to be appreciated. The film has a contemporary setting, portrays vividly the difficulties of life in a modern town in an African country. It highlights the traditions, especially in the character of the mother. It also highlights the modernisation of Africa, especially in the father who walks out on his family and the difficulties that the young boys get into, especially stealing and being caught by the police. While the mother has a breakdown, the boys are sent to an institution up-country where they find life very difficult, deciding to run away. The goal is to go to their father. An uncle has bought them a gift and kindled in them the desire to be with family. They discover that their mother is very ill and that they have to support her and to readjust their dreams to reality. While this kind of plot could be dramatised in any culture, it is more interesting to see it in an African context, with the straightforward but moving skills of African film-making. 1. A film from Chad at the beginning of the 21st century? The quality of the film-making? The portrait of life in Chad? Social issues? 2. The location photography, Chad and the border with Cameroon? The village, the desert, the contrast with the city? The scenes of the coast and the sea? The musical score and songs? 3. The credits and the focus on the father, his wandering the desert, his close look at the camera and to the audience, no reference to who he was or what had happened? His leaving his family, the fantasy of his appearing in the film to the children, in their dreams? His absence, his wife's resentment, sending the poster to his children? The consequences of the father leaving the family? 4. The portrait of the boys, their age, their characters, the opening in the house, jokes, the bedroom, the meal? Their mother's return, their standing waiting for their father, the football match and his supposed to be referee, the other friends? Their love for each other? Care for each other? The visit with their uncle and his music? Their mother and her sewing, her complaints about their absent father? Their going to see the film, stealing the film, going to the police, being sent away, the institution, the head and his promise of educating them, the role of the Koran? The work, play, the hardships, running away, the beatings, the older boy being chained? His infatuation with the girl? The sending of the poster and the contact with their father? Amine and his asthma, going to the hospital? Its recurring in the institution? The boys running away and Amine's feet being torn by thorns? The boys taking his medicine, his illness, his death? 5. The portrait of Tahir, his love for his brother, caring for him, the attempt to escape, his getting advice from the woman at the institution, the poster and what it meant to them, their uncle's visit, the relationship with the girl, his decision to leave, getting the lift, the girl going with him, going home, his mother's absence, the institution, his mother's mental collapse, his assisting her, feeding her, love for her? His future? 6. The portrait of home life, the family, family breakdown, the mother sewing, her withdrawing into herself, sending her sons away, her illness? The importance of the singing and her being able to sing with her son? 7. The uncle, his friendship, music, his role as a bond in the family? 8. The head of the institution, his severity, authoritarian, the woman who liked Amine, the memories of her dead son, giving him the honey for his health? 9. The young girl, her place in the institution, deaf mute, attraction to Tahir, leaving with him? 10. A portrait of children and adults, life in Chad, in the village, factory work, needs, poverty, the need for justice?